3 discs are easy to see against the white game boards. Printable templates let users personalize every blank award slot & header. 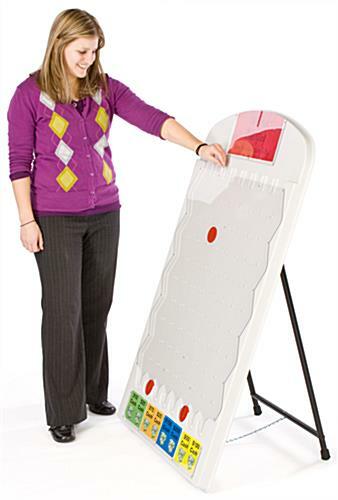 Floor-standing game boards work at the front of any exhibit. Uncomplicated game is fun for all to play! 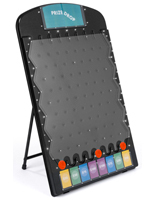 Blank game boards make it possible to add a form of entertainment to any promotional presentation. These gaming products were built around the popular American TV show, The Price is Right yet have a simple design everyone can enjoy. There are no additional game parts or game pieces needed to put the game boards together. 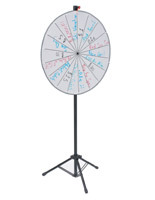 Contestants are given a flat round disc to drop into the gaming fixture. 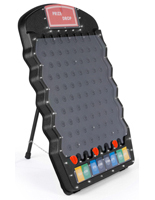 These blank game boards, also known as prize drop displays, feature a field of 68 pegs. These pegs, or game pieces, are dispersed throughout a game so no result is predictable. 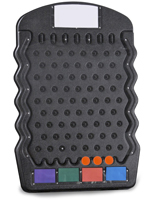 The round puck ricochets against each peg, ultimately landing in one of eight prize slots. 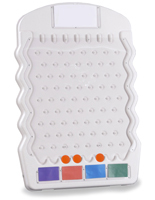 Blank game boards, as shown here, are completely custom-made using the provided templates. Simply follow the guidelines, creating your own printable cards. The gaming fixtures suit a variety of locations, including trade show displays, retail stores and corporate events. 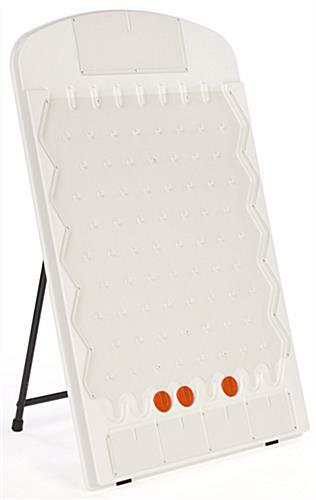 These blank game boards draw in crowds of enthusiastic players and spectators, exposing an advertising campaign to a broader audience of potential customers. 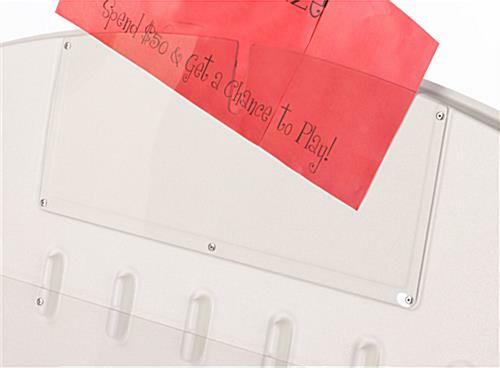 The customizable displays, with printable prize cards, are constructed from white ABS plastic for lightweight yet sturdy gaming tools. 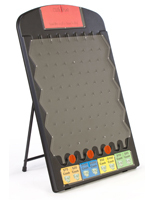 These blank game boards are equipped with powder-coated steel stands to easily set up an exhibit. No additional game parts or game pieces needed! 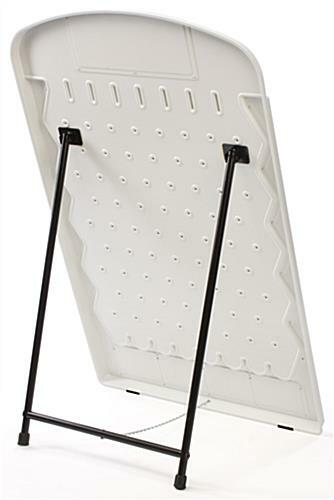 The gaming fixtures measure 48" high and are therefore viewable from far away. These blank gameboards create a "plinking" sound as the discs hit the pegs, building anticipation and interest within a crowd. These gaming tools are recommended for utilization within a tradeshow booth or in a shopping center, to generate more traffic. 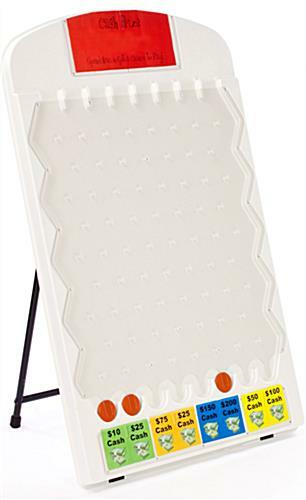 Why not have the blank gameboards encourage shoppers to spend up to a certain dollar amount? 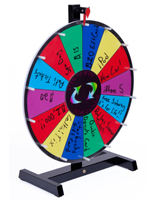 For example, for a certain amount spent or donated, customers will receive a turn to play! 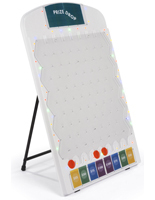 These portable blank gameboards not only entertain guests but they will also help increase the overall success of an advertising presentation. 25.3" x 48.0" x 21.0"